London in the spring of 1665 is a city full of fear. There is plague in the stews of St Giles, the Dutch fleet is preparing to invade and a banking crisis threatens to leave Charles II’s government with no means of paying for the nation’s defence. 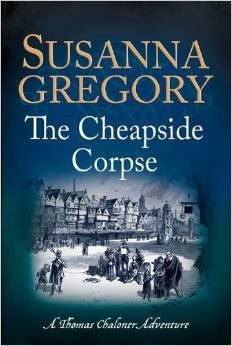 This is the 10th in the Thomas Chaloner series; however, I only became aware of Susanna Gregory in recent times so it is the first novel I have read in this series. I didn’t have to read the previous nine novels in the series to understand what was happening in this one. The year is 1665 and Chaloner works for the Earl of Clarendon, a Minister in the government of Charles II and is also co-opted by government intelligence to work under Spymaster Williamson. The Dutch are preparing to invade England and Charles II has taken money from the goldsmiths – banks, particularly those who supported Cromwell, to fund the war. Many of the smaller banks were ruined as a result. A gambler, Colburn, who borrowed from them to pay for his very expensive gambling habit and then committed suicide because he could not repay the debt, further exacerbated the situation for the smaller banks. Taylor’s Bank bought a lot of the debts from the smaller banks but as there were no regulations relating to interest at this time, many of the debts grew substantially when the interest rates more than doubled when Taylor’s Bank took the debts over. The behaviour of the banks, Taylor’s in particular, sets off a series of murders in Cheapside, the poorest part of London, which Chaloner has to solve before the angry mobs cause another run on the banks. The greed of the bankers is blamed for all the ills of society and that is only worsened when the plague also makes an appearance in London. Any house where a known plague victim resides is boarded up to prevent further outbreaks. However, the poor see this as just another way of driving them out of London because it is only the houses of the poor that appear to have the red crosses of the plague daubed on them. It is a city in turmoil and someone is trying to create an uprising against the rich and the banks, which will not help Charles II to finance his war with the Dutch. Chaloner has a huge task ahead of him to solve the murders and bring about order and calm. He is a true investigator and clear thinker and it is fascinating to follow his path to the end result through so many twists and turns. I thoroughly enjoyed the historical context of this novel and also following Chaloner, watching him connect the dots, without the investigative aids we take for granted today, and yet getting the desired result. It was certainly an interesting period in London’s history and Gregory captures the atmosphere of Cheapside and the daily lives of the poorest of the poor and the conditions in which they were forced to live. This is a great book for those who are interested in the early history of London, around the time of the plague, the reign of Charles II and before banking regulations were introduced. There are also historical notes at the end of the novel if you want more. Enjoy.